In a way, I wasn’t wrong, but tools and capabilities aren’t really what I came away with this time around. Not to minimize the importance of the tools I saw, which are mind-boggling both in their seemingly limitless capabilities and agile range of use, but this time, the aspect of the event that struck me was the importance of design and innovation being driven by vision. That is what gives these tools both purpose and power. Don’t get me wrong: Process, tools and execution are what ultimately make things possible. They’re the brick and mortar, the trowel and the plumb line, the blueprint and the schedule, the wheels on the trucks and the hard hats on the workers’ heads. But without the unifying vision bringing it all together and giving it all purpose, processes and tools are little more than disconnected bits and pieces of potential waiting to be brought together. 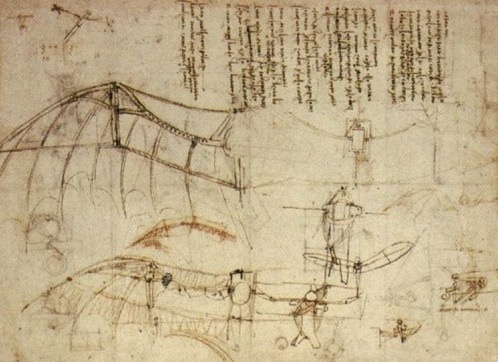 The easiest way to visualize what I am talking about (no virtualization needed), is to conjure up an image of one of Leonardo Da Vinci’s mechanical drawings. That’s where the genius reveals itself: not in the skills and artisanship that come later (problem-solving is fun), but in the ability to articulate the idea itself. That is what we’re talking about here, only with a much bigger sandbox. 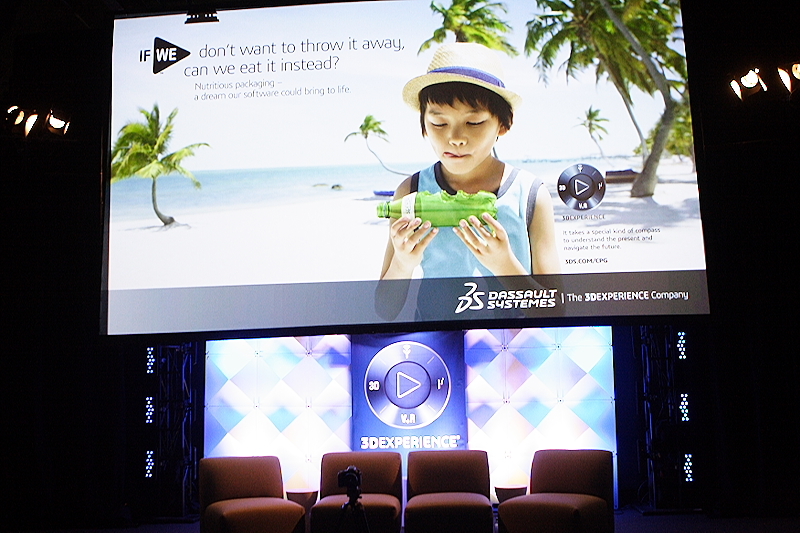 What I was reminded of at this year’s 3DExperience Forum was that the real genius of innovation lies in developing the right ideas and articulating them. That’s where the real power is. That’s what drives innovation and progress. 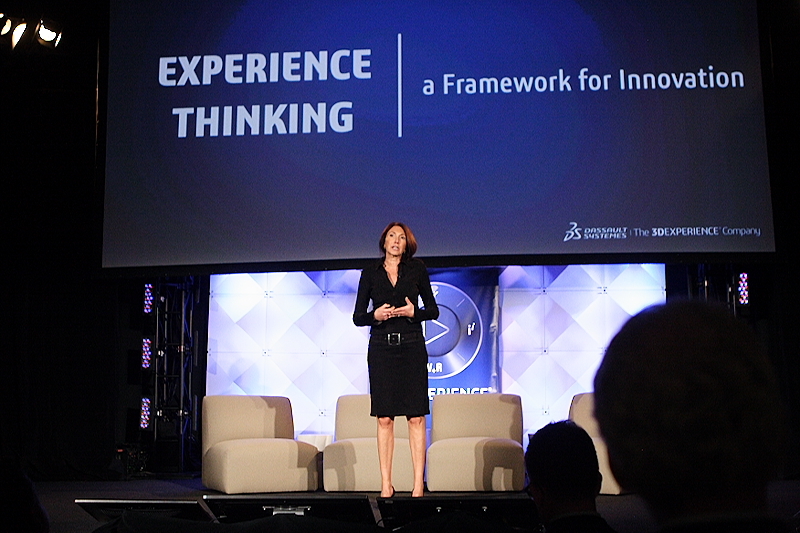 Before the folks at Dassault Systemes even get into the business of helping the world’s most brilliant minds innovate towards (and beyond) their vision, they first help them lay out the foundation for that process by providing tools that help them nail down the ideation and vision, and even push the envelope as far as it will stretch. Here’s a link to all of the products they offer (it would take me far too long to get into it here). That’s because ideas are about more than engineering and design, and if you don’t nail down the idea properly first, you’re missing the most important element of your world-changing project. No matter how well-built it is on the tech side, its impact may not be what you might have hoped. The right mindset and approach to design, along with the right partners, can make all the difference: Ideas first, execution second. In Parts 2 and 3 of this series, we will talk about the shift from the internet of things (#IoT) to the internet of experience (#IoE), and what that means in terms of concrete innovation like self-driving cars, enchanted objects and artificial organs. We will also talk about self-organizing movements (Crowd Companies models), and other pretty exciting new directions for science, tech, medicine, urban design and our daily lives. Going to events like this is amazing, not because of the tools themselves, but because of all of the amazing ways they help shape and transform the world in the years ahead. Today though, I just want to introduce the concept of Experience Design and Experience Thinking, as a framework for innovation. What we are talking about is a mindset, a focus, an understanding that design has to address more than just devices and objects. Design ultimately has to address the experiences that these devices and objects will create. 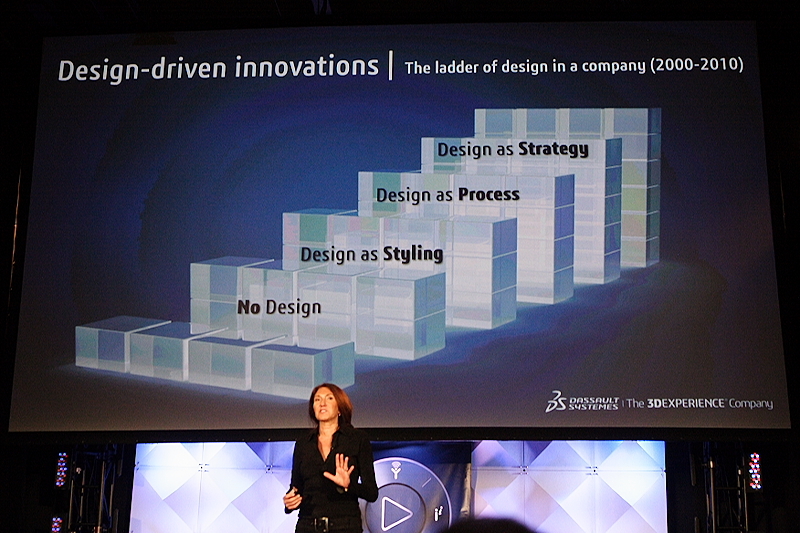 Below is a photo of the natural evolution of design thinking in most companies between 2000 and 2010, as explained by Dassault Systemes’ very own Monica Menghini (EVP and Chief Strategy Officer). As a footnote, Apple’s model may have helped mainstream this evolution, but consumer products are not driving this on their own. The same evolution can be found in urban design, architectural design, healthcare, manufacturing, space exploration, education, retail, and so on. It has become a universal and vertical-agnostic phenomenon. Companies that have not yet adopted this model are struggling to keep up while those that have are more competitive than ever. There is a universal methodology and mindset here that can be applied to every industry and every company, no matter how big or small. 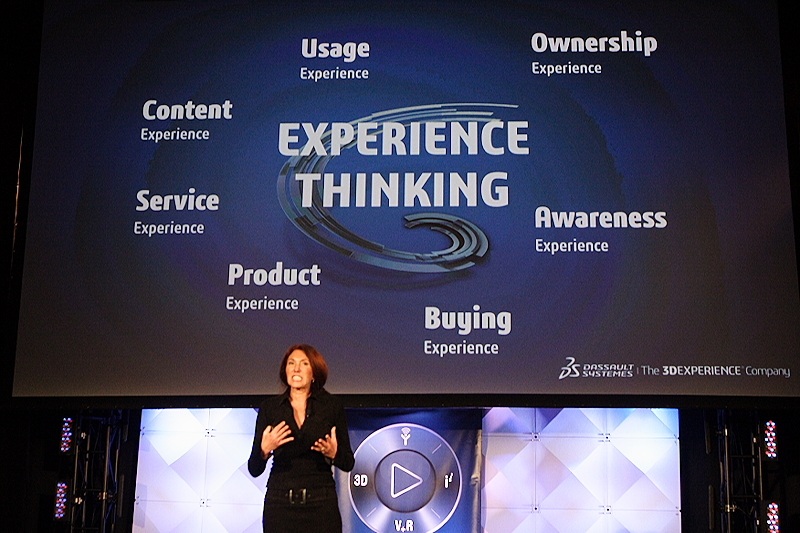 Below is a simple map of what we are talking about in terms of experience thinking (and experience design). Similar thought process to what you might already know as UX, but applied to every internal/external touchpoint and every process, not just the enduser experience. What’s important to understand is that where there’s a model, there’s a system, and where there’s a system, there’s architecture. None of this happens by accident. It happens by design. That design has to be ideated, developed, mapped out, built, tested, retested, deployed, and continuously improved upon. That requires vision, collaboration, organization, the right toolsets, the right business and cultural ecosystems, and so on. What I rediscovered at 3DExperience Forum was how all of these pieces can be made to fit together seamlessly to not only make the ideation-to-execution process seem seamless, but in a way that injects that process with unprecedented velocity (faster prototyping through advanced virtualization) and at a fraction of the cost that similar projects would have been weighed down by only a few years ago. (Virtualization makes prototyping and testing in completely realistic digital environments much more cost-effective than having to build clunky and expensive physical prototypes, even the 3D-printed ones.) We’ll talk more about that too, but for now, I want you to focus on what Experience Thinking is, and how indispensable it is to developing a complete strategy (and vision) for your ideas and projects. Why? Because everything you and I design ultimately serves to create either a positive or a negative experience somewhere down the line. At its core: Positive experiences win. Negative experiences don’t. Your company’s success is 100% connected to your ability to create the former rather than the latter, and more so now than ever before. Stay tuned for Part 2. We’ll dive a little deeper into what all of this means, and how it is already being applied to world-changing innovation, some of which will blow your mind. Hopefully, this discussion will not only inspire you to improve your own processes but also help you get better at fostering groundbreaking innovation within your org and for the market(s) you serve. Until we meet again, I recommend that you click here and scroll down to the “Portfolio of Industry Solution Experiences” section (almost all the way down). Really cool stuff, and a great little primer if you aren’t familiar with some of what is actually possible already. (Some of it will seem like sci-fi, which… is one of the things that I find so cool about all of this. We really are living in exciting times.) There’s also a link to the event’s livestream.